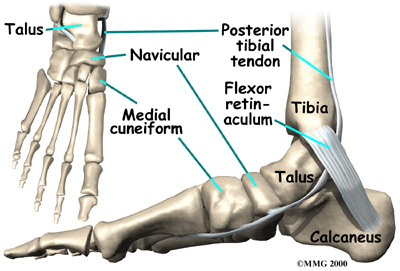 The Navicular is an intermediate tarsal bone on the medial side of the foot. Its name (os naviculare pedis; scaphoid bone) derives from the human bone's resemblance to a small boat. It articulates with four bones: the talus and the three cuneiforms; occasionally with a fifth, the cuboid. While rare in the general population, stress fractures of the tarsal navicular bone are frequently incurred by professional athletes. The left navicular. Antero-lateral view. The navicular unique anatomic location subjects it to medial and lateral compression forces from the first and second meta-tarso-cuneiform joints, respectively. While the medial forces are shared with the talar head, the lateral forces are borne by the navicular alone. As a result of this unequal distribution of forces, maximum sheer stress is concentrated at the central third of the bone. Moreover, contraction of the tibialis posterior tendon, which inserts on the navicular’s medial tuberosity elevates the medial stress experienced by the navicular. With repeated compression of the navicular such as during running, the majority of forces are concentrated at the center of the bone, causing the navicular to be repeatedly “bent” at the avascular zone. ↑ Shakked RJ, Walters EE, O’Malley MJ. Tarsal navicular stress fractures. Current reviews in musculoskeletal medicine. 2017 Mar 1;10(1):122-30. ↑ 3.0 3.1 Gross CE, Nunley JA. Navicular stress fractures. Foot & ankle international. 2015 Sep;36(9):1117-22. ↑ Hossain M, Clutton J, Ridgewell M, Lyons K, Perera A. Stress fractures of the foot. Clinics in sports medicine. 2015 Oct 1;34(4):769-90. ↑ McInnis KC, Ramey LN. High-risk stress fractures: diagnosis and management. PM&R. 2016 Mar 1;8(3):S113-24. ↑ Mann G, Hetsroni I, Constantini N, Dolev E, Palmanovich E, Finsterbush A, Keltz E, Mei-Dan O, Eshed I, Marom N, Nyska M. Navicular stress fractures of the foot. Sports Injuries: Prevention, Diagnosis, Treatment and Rehabilitation. 2015:1-2. ↑ Bennell K, Matheson G, Meeuwisse W, Brukner P. Risk factors for stress fractures. Sports medicine. 1999 Aug 1;28(2):91-122.